This award recognizes the outstanding efforts of journalists, writers and bloggers, especially those who use new media in their struggle to promote peace. This award recognizes the work of those involved in mediation as an effective and sustainable process for resolving disputes. This award recognizes the efforts of peace activists and community leaders who have created change within their societies. This award recognises those individuals whose support of peace promotions have resulted in tangible change. This award recognizes individuals or institutions that have promoted peace activities to create better understanding between cultures. This award is targeted at youths below the age of 30 who have been very active and successful in peace promotion activities. Asia, Middle-East, Africa, Europe, North America and South America. Exhibit Tun Dr Mahathir's determination even in the face of difficult circumstances to overcome obstacles and continue his peace advocacy. 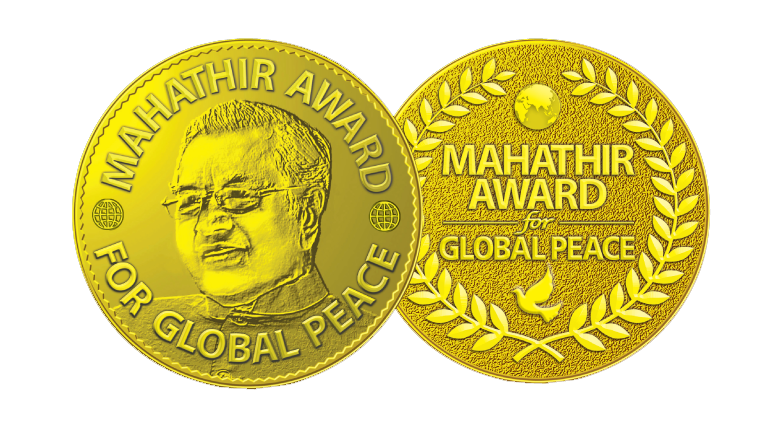 Apply Tun Dr Mahathir's philosophy of finding new ways to communicate the views of millions and rally peacemakers to work for global peace. Demonstrate Tun Dr Mahathir's qualities in building global momentum through various platforms. Emulate Tun Dr Mahathir's tenacity and willpower in defying attempts to silence him and prevent him from revealing to the world the war efforts of others.